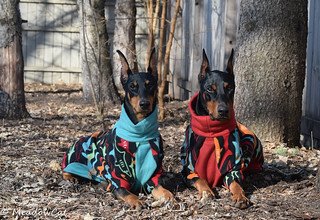 Doberman Forum : Doberman Breed Dog Forums > Doberman Specific Chat > Doberman Health > Cardiologist in MI? I’ve been saying for awhile I need to get Sully in for a cardio work up, he doesn’t show any symptoms of DCM just want to make sure he doesn’t have any issues going on unnoticed and get ahead of it if he does. We live in SE Michigan and MSU is close enough but I have a bit of a bad taste in my mouth level of care I’ve received in the past (dermatology not cardio). I did a quick google search and there’s a few other clinics in the area specializing in cardiology. Anyone in the area have any recommendations or maybe some guidance on what to look for or ask? Many AKC dog shows will have clubs that offer the Echo's and Holter along with eye clinics at a much reduced price. Usually when it is a cluster - like 3 -4 shows in one place. Control_Freak and ECIN like this. I asked a few people locally and https://www.vetcardiologyconsultants.com came highly recommended, so I called this morning and made an appointment in April. If you have the time and interest, there will be a heart clinic at the UDC National near Pittsburgh, PA. in May. They will be performed by a Cardiologist and are typically cheaper than you will find at a regular veterinary office. You can also see many Dobermans in various events and interact with other Doberman people from across the country. Around here it's our regular board certified cardiologist who does the heart clinics at shows. The imaging equipment is often not as fancy at a mobile clinic but if you're just doing a checkup for a dog who you don't already know has DCM it's great, and cheap! You can rent a holter from vet schools and it's about 1/3 the cost it is at a specialist too. Same here at our shows, Greenouki. The holter we rent from our Utah Doberman Club at a very reduced price - if you are a member. Ask if they sponser health clinics or cardio clinics at reduced cost--also ask if they rent Holter equipment. Many of the chapter clubs do this--Mt Hood in Oregon does two a year one in the winter and one in the summer--a board certified cardiologist does the echo and the club has Holter equipment that it rents to club members. The cost for a Holter and echo ends up being about half what it would cost at the cardiologists regular prices. Usually you have to be a member of the club to borrow equipment but it's well worth it. I work on Saturdays and can be scheduled/called in on Sunday’s, so it makes it kinda hard to know for sure if I can make a weekend show, especially out of town. I make an appointment with a highly recommended office that only does cardiology, not sure what the average price is but they charge 410$ for exam and echo, I forgot to ask the cost of the Holter. Clinics held at shows typically run $150 - $225 from my experience for an echo. Oh, and by the way, the UDC National clinic will be during the week and not on a weekend. I would also contact your chapter clubs...my club is having a clinic coming up here in MN...the echos we offer with the cardiologists here are about 1/3 of the cost of the price of a regular appointment. We're doing a two-day clinic in May, and echos are $210 each.